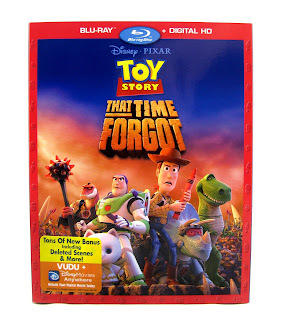 Today marks yet another day in Pixar history with the home video releases of both Inside Out and Toy Story That Time Forgot! Today I'll just be reviewing TSTTF (Blu-Ray with digital copy), but look for my full write-up on the Inside Out Blu-Ray right here soon as well. 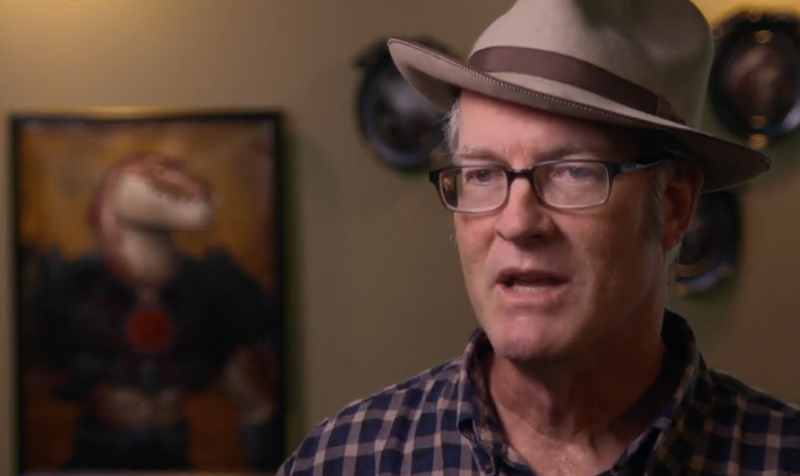 Toy Story That Time Forgot is a 22 minute television holiday short that aired on ABC on December 2nd of last year. 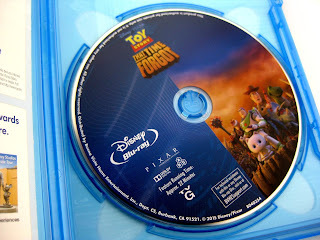 Ultimately (after multiple viewings), I found that this is a worthy addition to the Toy Story franchise with some great new characters (two words- Angel Kitty), an engaging little storyline, fantastic animation and perfectly fitting music by Pixar veteran, Michael Giacchino. 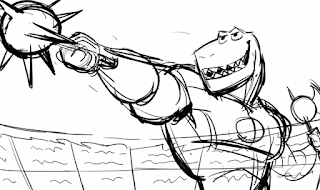 Steve Purcell (co-writer and co-director of Brave) directs while Galyn Susman (producer of many of Pixar's shorts) produces. 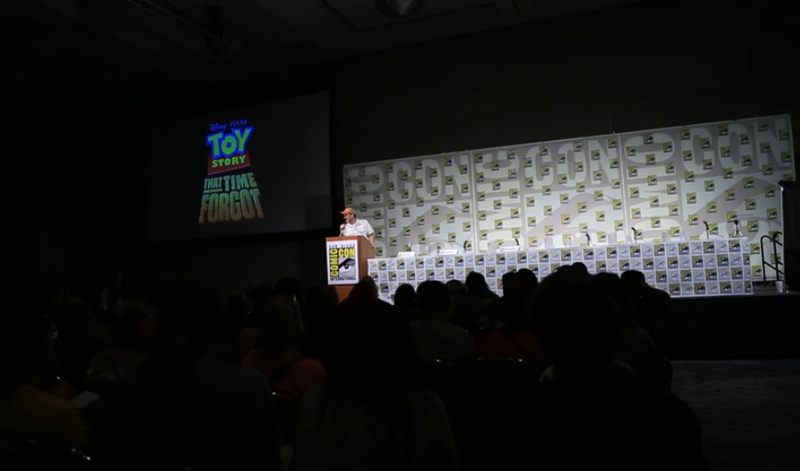 Though I can't honestly say that this is my favorite of the Toy Story shorts (in fact I'd actually say I enjoyed 2013's television Toy Story of Terror a bit more, but of course that's completely subjective), there is just enough of the Toy Story heart, humor and fun here that I've come to expect. It definitely grows more on me after each time I watch it! I do have to note: Though it was originally marketed as a Christmas special, Christmas does not play a big part in it at all (so if you're expecting that classic, holiday feel, you may be taken back). Just a quick FYI! Anyway, now that my brief thoughts on the film itself are on the table, lets get to diving into the Blu-Ray and its awesome special features! 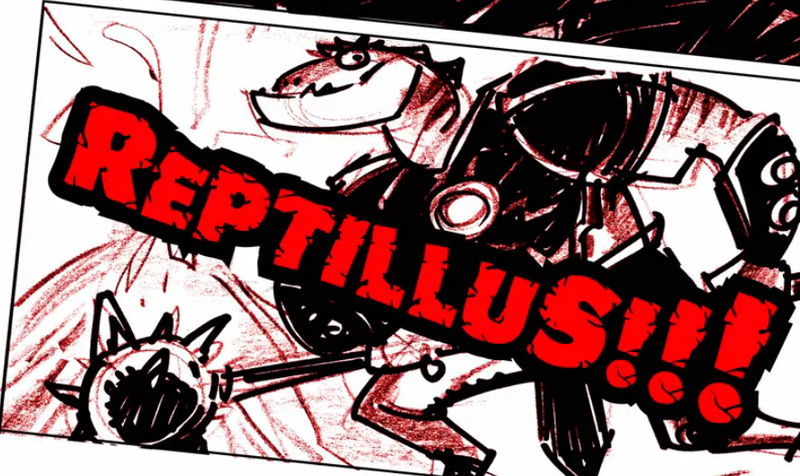 Reptillus (running time 10:51)- This is a very cool mini documentary that dives into the rich history and backstory of Reptillus Maximus and the Battlesaurs! 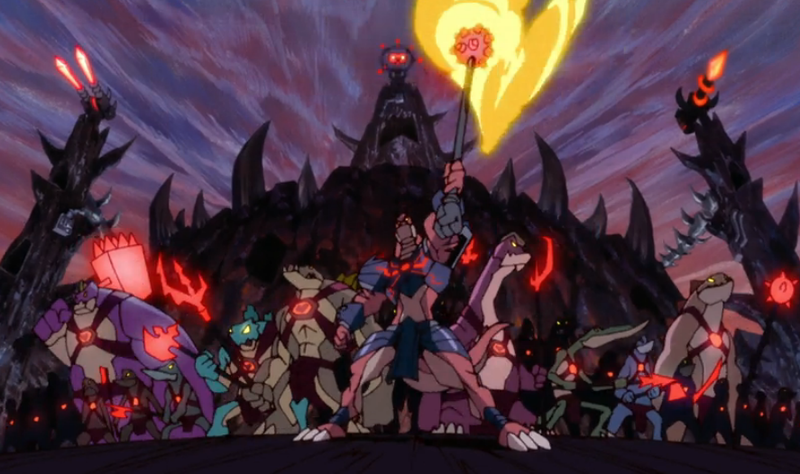 Man did the filmmakers go above and beyond with the creation of this fictitious TV show and toy line. This featurette really gives you a whole new appreciation for how much thought and details went into That Time Forgot. It also makes me want to see more from the Battlesaurs- I would actually watch it if it became a real TV series! 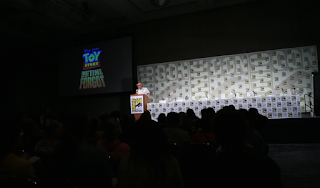 Toy Story Goes To Comic-Con (running time 3:34)- Takes you back to the San Diego Comic-Con 2014 where they revealed elements from the film (story, Battlesaurs, concept art, etc.) for the first time to an audience! Karaoke: My Unexpected Friend (running time 3:59)- Reptillus sings My Unexpected Friend, a late 80's/early 90's style love ballad that was created just for this release! It's hilarious- they really nailed that genre perfectly. 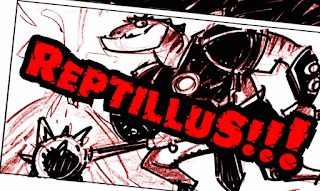 You can choose "Reptillus Sings" or "You Sing". 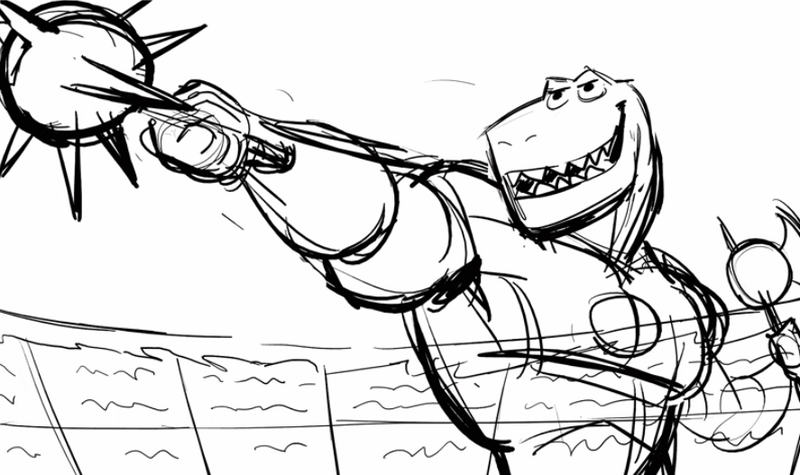 Music by Alex Mandelm, Lyrics by Alex Mandel & Steve Purcell and Performed by Kevin Mckidd (voice of Reptillus). 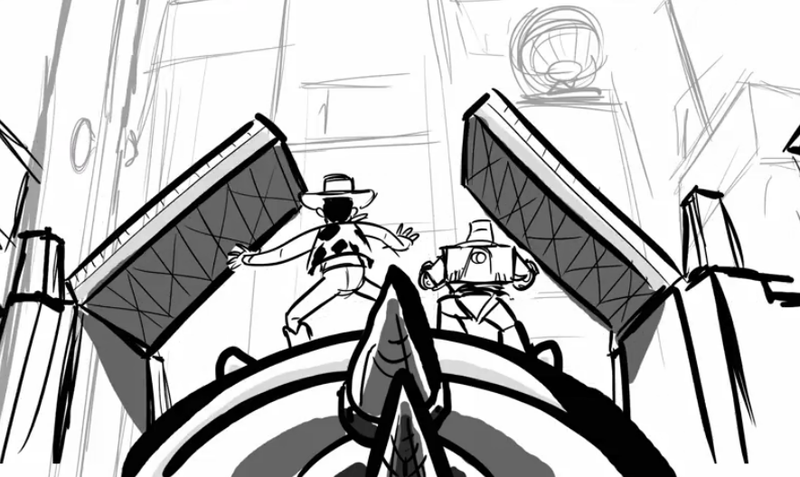 Battlesaurs Animated Opening (running time 50 seconds)- Back when I first heard about the main Battlesaurs concept for this short, I totally predicted that the film would include a fictitious 2D TV opening/theme song (as if it were a real 80's style animated series; Pixar loves to do that sort of thing). Though it didn't appear in the final film (however it was suppose to originally, more on that below), my prediction is now true with this home video release! 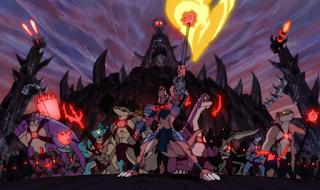 The filmmakers behind this intro, again, went all out. It's brilliant. 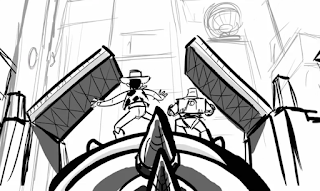 It perfectly captures the 80's cartoon intro in the same vein of He-Man and the Masters of the Universe, Transformers, Thundercats, etc. Audio Commentary with Director Steve Purcell (running time 21:36; length of the film)- Audio commentaries are always my favorite! Here, director Steve Purcell gives some great insights into the making and story of That Time Forgot. Highly recommended! 1.) 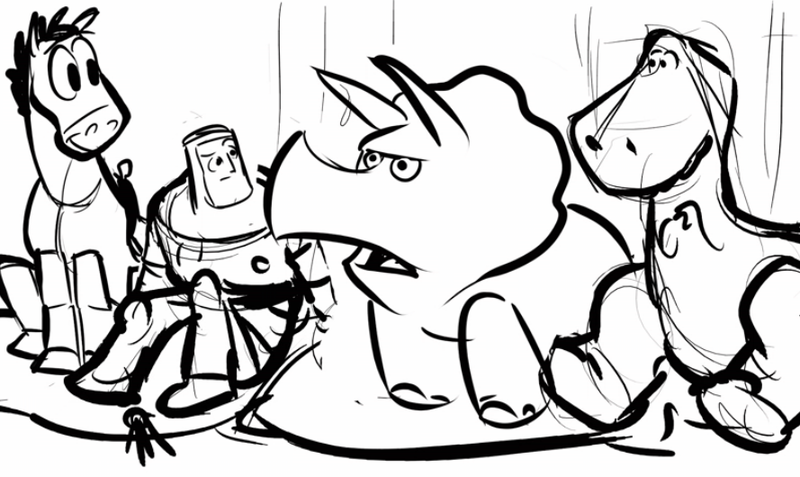 Battlesaurs Christmas (running time 3:06)- This is an alternate opening that actually starts with the Battlesaurs TV intro/theme song! 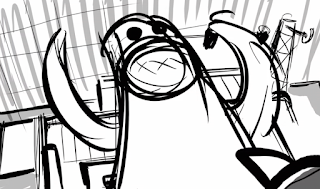 There are a lot of cool elements in this scene- I actually wish that a lot of this was left in. 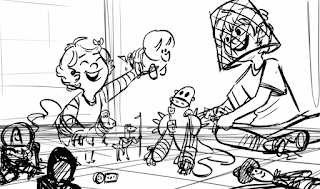 There are some cute moments with additional Christmas decorations and the revelation that Mason is actually (or at least was originally) Bonnie's cousin (which makes sense since they have a similar look). 2.) 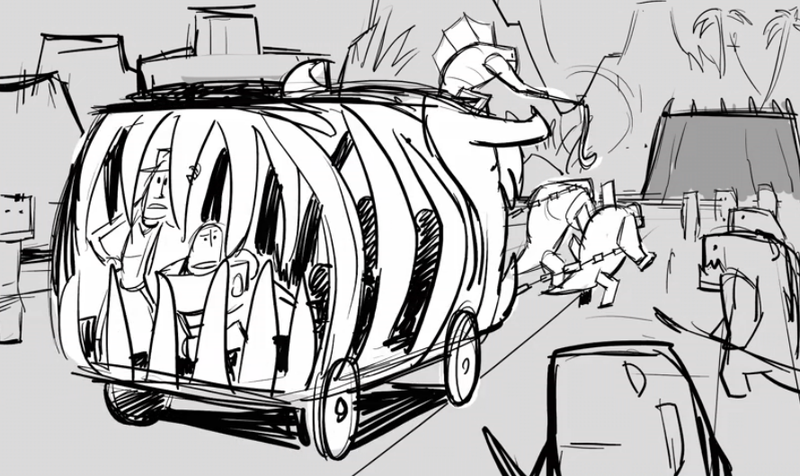 Prisoners of Bone (running time 1:22)- This is a brief scene featuring Buzz and Woody being carted to the "Arena of Woe" in a bone wagon. 3.) SOS (running time 1:07)- Buzz and Woody escape the arena via a goliathon and try to catch Bonnie and Mason's attention. 4.) Trixie's Proposal (running time 1:55)- More sock monkey antics! 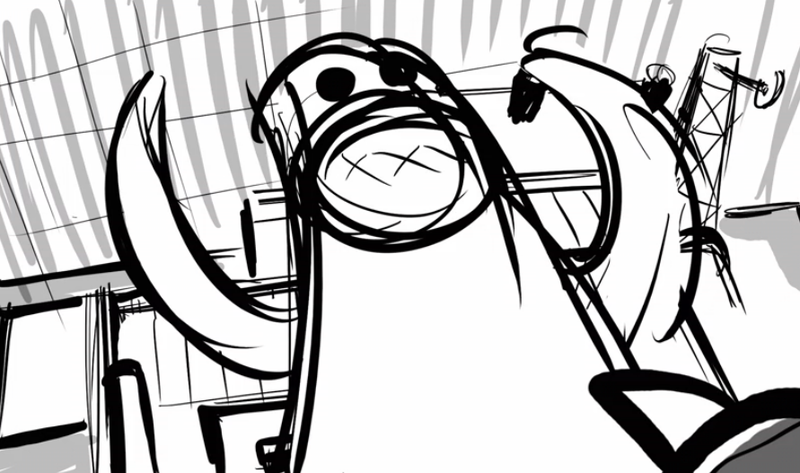 Though particular sequence was cut, the filmmakers were still able to use the sock monkey during the battle arena scene. 5.) Light of Play (running time 1:51)- An alternate (and longer) version of the final play scene with Bonnie and Mason. 6.) 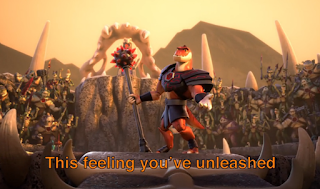 Battleopolis (digital exclusive; running time 3:36)- This deleted scene (just a longer version of the battle arena sequence) is only accessible online when you redeem your digital copy of the film! 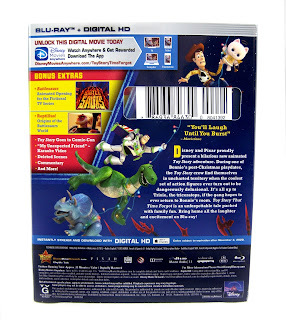 Just punch in the digital HD code (included with the Blu-Ray) on Disney Movies Anywhere and you'll be able to access this, the film and all the special features across all platforms. Pretty cool! But wait! There's even more. 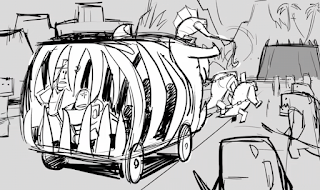 A little Easter egg is also included. 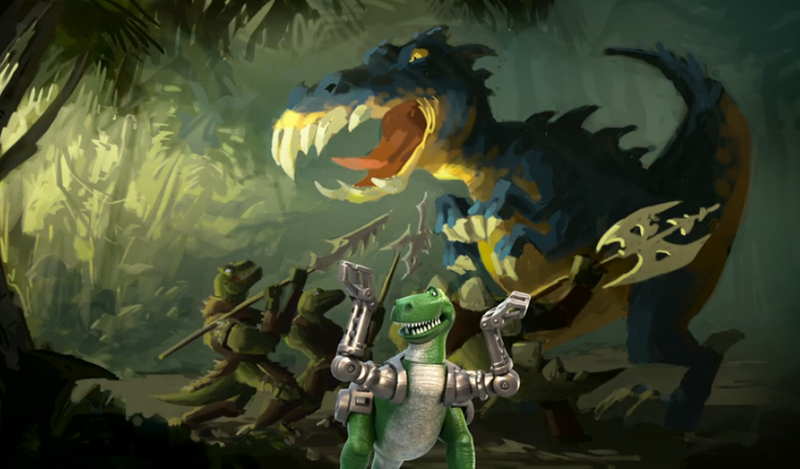 To find it, highlight the first special feature (Reptillus) with your remote and then click twice to the right. You'll then see the dinosaur structure's eye highlighted! 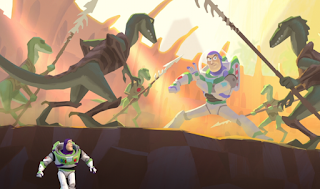 Just press enter and your good to watch 45 seconds or so of Rex and Buzz warding off the Battlesaurs in front of concept art. It's a "toolkit" of sorts (see some screenshots below). Enjoy! There you have it! As you can tell, this Blu-Ray has some really great features. I had an absolute blast checking them all out today! 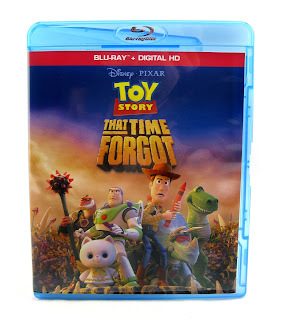 That Time Forgot is a fantastic addition to my ever expanding library of films and a must have for Pixar fans. Be sure to visit your local store to pick up your copy of That Time Forgot on Blu-Ray or DVD (which has less special features, mind you) or visit Amazon using the link below to purchase! Of course you can also buy it digitally on iTunes/Disney Movies Anywhere (though if you buy this Blu-Ray, it comes with the digital copy + Disney Movies Anywhere access to the film and all its special features- so no need to buy this and the digital version separately). 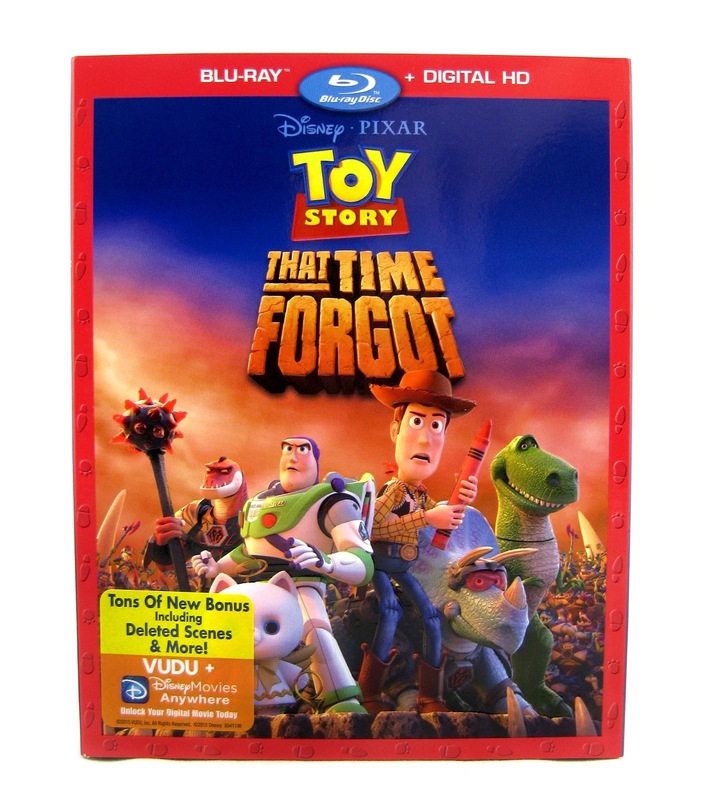 For additional products surrounding Toy Story: That Time Forgot (such as a very cool action figure collection), feel free to explore the label to the right.